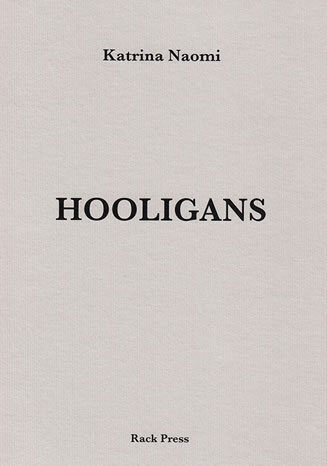 Hooligans has just been reprinted after 9 months. Katrina Naomi wrote Hooligans after learning that her great-grandmother was involved with the Women’s Social and Political Union – one of the more militant Suffragette movements.Hooligans considers the nature of women’s protests for the vote, ranging from violent demonstrations and window breaking, to imprisonment and force feeding. A satisfying amalgam of personal and political…The challenge for the poet writing about violence…is to ensure appropriate poetic transformation of the material…Most of Naomi’s poems meet this challenge triumphantly, particularly the opening work which makes a potently original analogy between a Suffragette and a chimney…The poem packs its punch with great economy ending on a deft pun on ‘house’ conjuring the Commons as well as home. Hooligans…reflects upon the nature of women’s and occasionally men’s protests for the right to vote and stand in an election. The poems here, many incendiary in tone, range from visions of violent demonstrations and window breaking, to imprisonment and force-feeding.